Andrew had his swimming mid-test at school this morning. To show some supports for him, I made this froggies bento. Hope he could swim fast with his frog style, breast stroke. The little froggies were made from cucumber and the faces were decorated from crab stick and carrot. Put the froggies on the top of the rice. I used the 2 tiers round box this time. The size of the top tier (green) is smaller than the bottom tier (blue). Inside the top tier : raspberries, tenderloin beef cooked with salted black bean and onion, and stir fry veggies (chayote, corn, baby corn). Oh my god this is just too cute!!! <3 Sooo adorable little frogs! Can I check with you, how do u cut the froggies' hands? Is it by cutter too? I came across your blog from my blogger's friend. You have a wonderful blog and I love all your bentos very much. I hope that one day I can be as creative as you and make one for my little darling. Oh dear, the frogs are SUPER cute!! And I like the flower in the center too! So perfectly done! 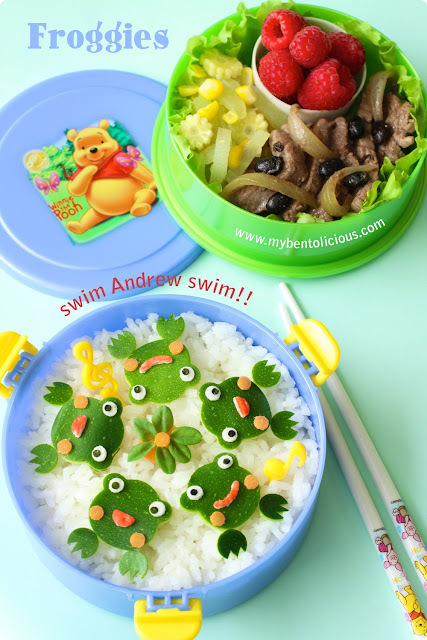 Another nice bento and I love your quote "swim Andrew swim!!". You are creative, Lia. @Vanessa : hahaha ... it's like Forest Gump's movie except that one is run Forest run :D Thanks a lot Vanessa! @Ceinwyn / Ingrid : Thanks a lot Ingrid! He passed the test but the score will be handing out early April. these froggies and their lily pad are soooo cute lia! i'm sure this really encouraged andrew... i hope he did great on his test! the veggies and beef sound yummy too, and the raspberries are a nice bright pop of color! Mmm, those look like delicious raspberries! I love your frogs and even your beef with beans and onions looks so beautifully arranged. Wow! U r v good w your hands cos u can cut such fine details! "Pei-fu"! @Fluteloop : Thanks a lot for the kind words! So so cute Lia, love them! OH Lia!!!! The froggies are soooooooooooooooooooooo kawaii!!! I really admire your patience! I know it is not easy to do so many froggies at one time! was having some problems posting comments yesterday - think everyone who saw the cute froggies were probably sending in their comments all at once!! ha ha - froggies are super adorable and glad to know it did help A swim faster and well. @Anncoo : Of course you can ... the froggies will love it hehehe :) Thanks a lot Ann! Hi Lia, I love those frogs they are so cute and that beef tenderloin looks so tasty. I also came by to pass on the Sunshine Award to you. I picked you because you have been such a light on my journey though the bento blogging world. I know that sounds corny but it's true. Oh my charaben master, Lia! What cheerful froggies! I'm sure that he fully showed his ability with mom-made cheering bento! I'd love have the tenderloin beef! @prince n princess mum : Thanks a lot for both comment and for visiting my blog! What cute little froggies! The raspberries look so good...I can't wait until we have some in our area. Dear mbak lia, aq masih terkagum-kagum sama 'skill' yang mbak lia punya untuk ngebuat bento2 ini.